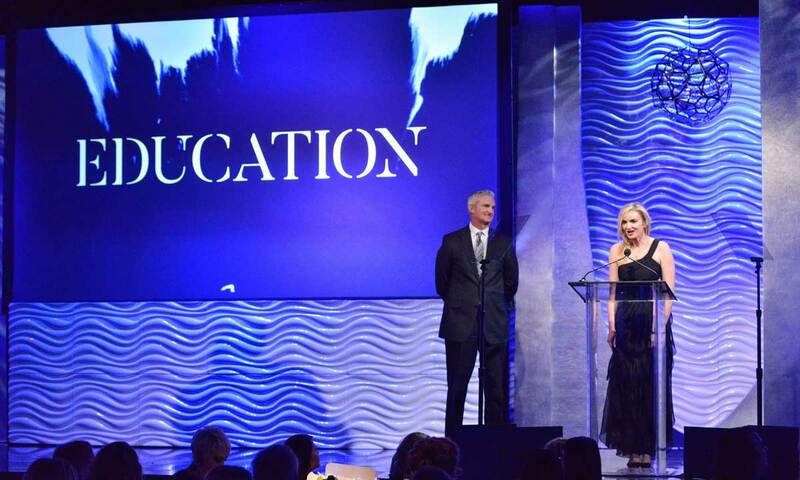 Unisource Solutions is an IIDA Southern California chapter sponsor and donor. Unisource Solutions is proud to receive another award! This time for our work on world-class mobile gaming studio Aftershock's new office. This dynamic new space was designed by OKB Architecture with Corporate Contractors, Image Options, Lam & Kaainoni Engineering Corp., and us! We took home a 2018 IIDA Calibre Award for Large Workspace. The annual awards recognize the excellent work of the International Interior Design Association Southern California Chapter project teams, celebrating the collaborative nature of outstanding design. 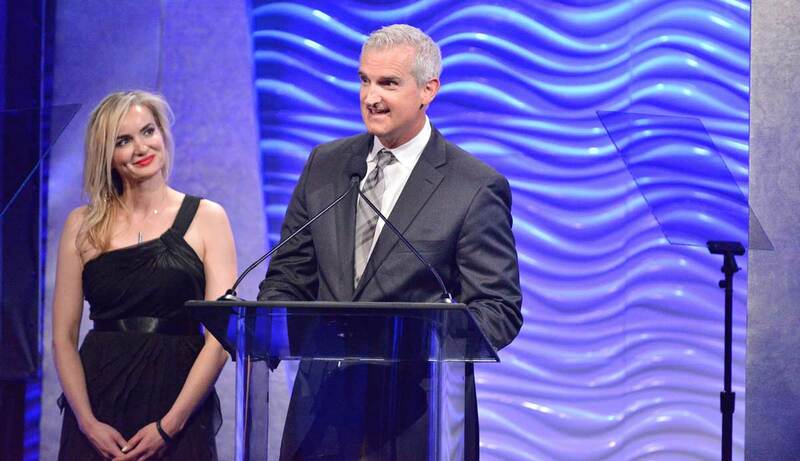 This year’s awards gala took place at The Beverly Hilton. 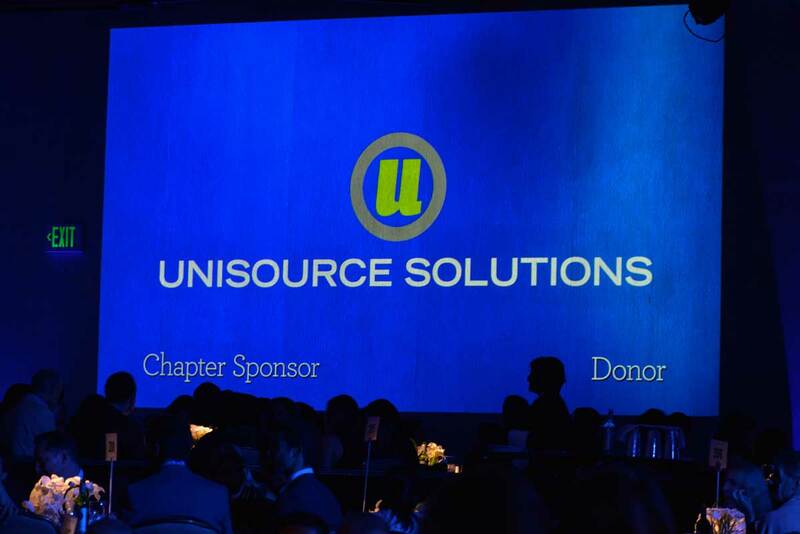 Unisource Solutions is a chapter sponsor and donor. Decked to the nines, fellow design firms celebrated the industry’s high level of work across multiple categories, including: extra large, large, medium, small, and extra small workspaces; hospitality; public and community spaces; health and wellness; and education. 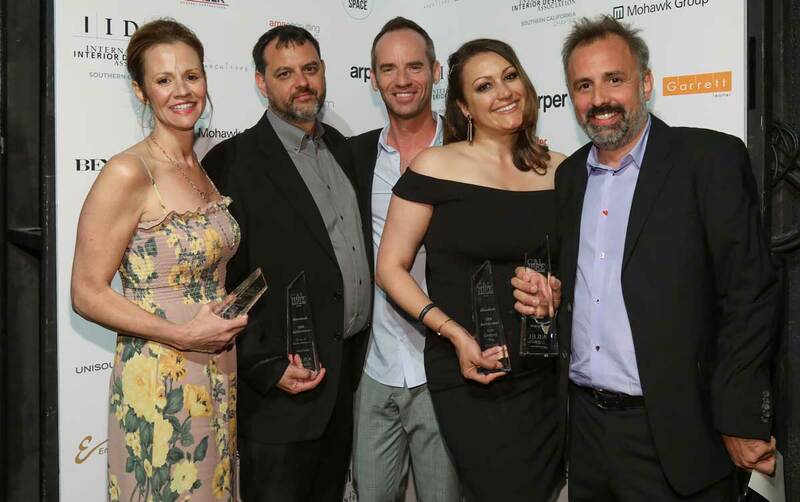 The winning team, left to right: Christine Scotti, Unisource Solutions; Mark Dogherty, Corporate Contractors; Shawn Bleet, OKB Architecture; Carmel Rodriquez, OKB Architecture; Jason Kerwin, OKB Architecture. 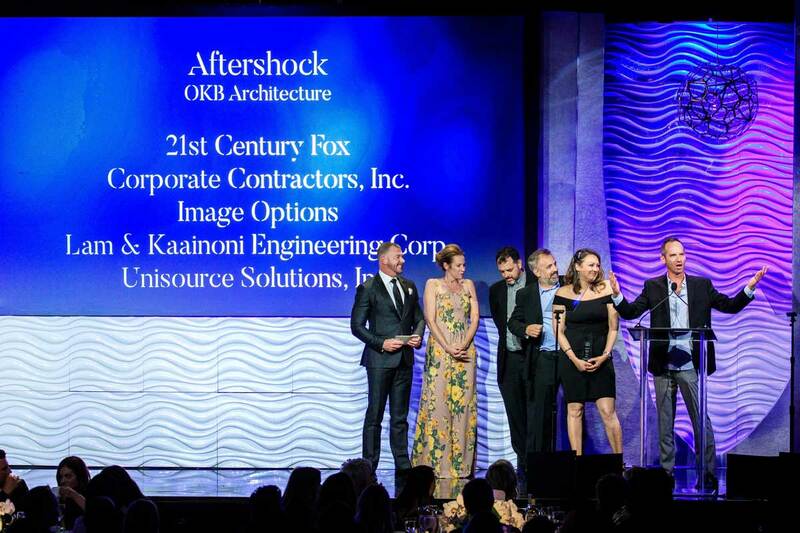 In attendance from Unisource Solutions was our Aftershock team including Rick Bartlett, Joanna Banka, and Christine Scotti who were instrumental to the project. In addition to winning the award, Bartlett presented the Education Award to LAUSD for the Maywood Center for Enriched Studies, designed by DLR Group with Maharam, Newson Brown Acoustics, Roshanian and Associates, Inc., and SJ Amoroso Construction Co., Inc.
Rick Bartlett and Joanna Banka, of Unisource Solutions, present the Education Award. The 38,730 square foot Playa Vista office plays with solids and voids in a playful way. A minimalist color palette of black, white, gray, yellow and green, is highlighted with a distinctly modern furniture program.